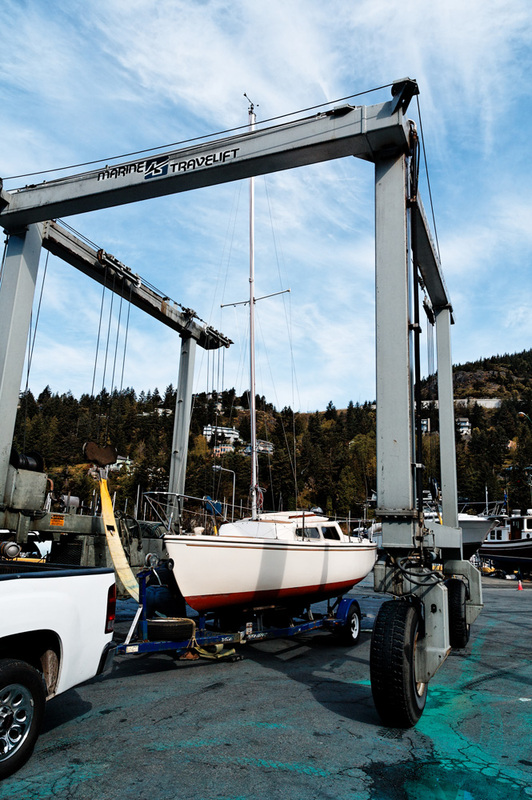 Madsu on the TravelLift at Thunderbird Marina in West Vancouver. My friend Aron helped me step the mast and just in time too – my lift time got moved up be a couple of hours, but we were ready. The yard crew was super busy with back to back lifts booked right through the weekend. Because we barely got the mast up by the time the lift was ready, I didn’t get a chance to tune the rig or even get the boom on before getting back in the water. It was a lovely sunny day, and I motored over to my slip at Sewell’s in Horseshoe Bay. It felt great being out on Madsu again – even if under power. 16 Apr This entry was written by bigsnit, posted on April 16, 2010 at 10:17 am, filed under Madsu and tagged Horseshoe Bay, Thunderbird Marine, Travellift. Bookmark the permalink. Follow any comments here with the RSS feed for this post. Post a comment or leave a trackback: Trackback URL.